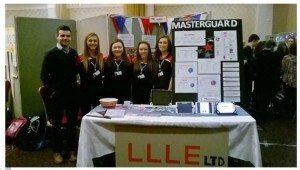 Four business shrewd girls from Scoil Chríost Rí, Portlaoise have been chosen to represent Laois at the Student Enterprise Awards in Croke Park with their product ‘MASTERGUARD’. Maeve Mannion, Saoirse Dunne, Elaine Dunne and Alice Keane came out on top from 33 impressive business projects exhibited at the Laois Student Enterprise Awards in the Heritage Hotel Portlaoise. The Portlaoise based girls are all keen sports players who saw a niche in the market for an affordable, comfortable mouth guard. The girls explained that with ordinary mouth guards you can’t breathe or talk properly and it was a problem for which they all wanted a solution. With their solid idea, research led the inquisitive young girls to APT, a manufacturer in Athlone who has undertaken the task to create their prototype, a modified, neater version of a standard mouth guard. “Without the endless help and support from APT, we couldn’t have furthered our project” explained Alice, Managing Director. The girls were later informed of their large capital costs once their prototype was manufactured. “All our fundraising conveyed how enterprising we were as a team. The support and co-operation of our Parents, Teachers and School Management was immense with all our fundraising initiatives!” said Elaine, Finance and Promotions Manager. The girls raised €1,500.00 by holding Christmas fairs, washing Teacher’s cars and investing money to return a profit. The team have planned to travel to Yorkshire to purchase a moulding machine from WHW to allow them manufacture their product. “In September last year we never dreamt that we would eventually travel to the U.K. in order to start the process of manufacturing our project” stated Saoirse, the team’s Sales and Marketing Manager. The girls aspire to look for local retailers that will stock and sell their ‘Mouthguard’ product and they hope to launch it in May. “This isn’t just a once off Transition Year project, we want to continue this for the future” explained Maeve, the company’s Quality Control Manager. The girls were thrilled that all their hard work has paid off to date and they hope that their project will prove successful in the future.